It is hard to believe that fall is right around the corner. The changing of the seasons always brings new beauty and reflections of the complexities of nature. By the end of summer, I am eager to see the transformation of the colors and textures that come with fall. Just as spring and summer bloom vibrantly with so much beauty we can enjoy in our homes, fall brings a similar display of warmer tones that are so wonderful to incorporate into your house and on your tables. I know it might seem crazy, but I am already planning my fall decor for this year. 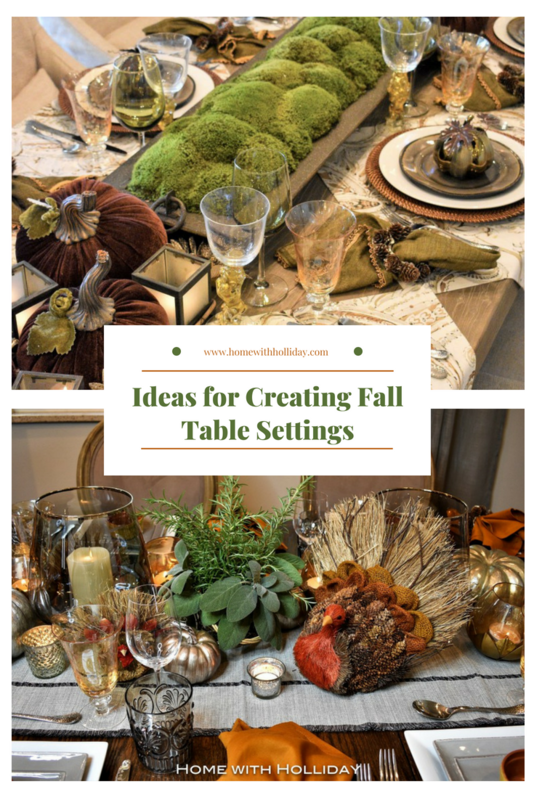 Today, I am sharing a few of my table settings from last year with some Simple Ideas for Fall Table Settings for daily use, for small or larger gatherings or even for your Thanksgiving table. I am also sharing a few products I am loving for this season (at the end of this post). This post includes affiliate links for your convenience and to help keep this blog up and running. With fall, cooler temperatures also come along so we really enjoy entertaining in the fall. Our smoker gets busy at this time of the year! I just started this blog this past October, so some of my very first posts were of some of our fall table settings from last year. I have learned a lot more about taking my photos since I got started, so please bear with me on some of these images. I had so much fun pulling this one together. I found these adorable turkeys at Cost Plus last year so that was my starting point. Some of these pieces are still available this year so this would be easy to recreate. To see all of the details of this table table setting, CLICK HERE. Really believing in using natural elements in each table setting I create, I had fun using my own herbs grown in my garden as part of this centerpiece. By the end of the summer, my herbs are growing like crazy and I can’t use them quickly enough. I end up giving so much of them to my neighbors and friends. Most don’t think about using them in your floral arrangements or in centerpieces, but it works really well. Not only is it a fresh look, but it also smells wonderful! Again, wanting to include natural elements in my centerpiece, I started with this amazing planter filled REAL moss. It worked really well in lieu of flowers, especially since this table was set several days before Thanksgiving. All I did to complete the look was to add in the brown velvet pumpkins and a few other fall accessories. To see all of the details, CLICK HERE. I created this quick and simple table setting for a small dinner we hosted right before Halloween. I wanted it to have a Halloween theme without it being too cheeky so I just played off the typical Halloween color palette of orange and black. Super easy! You can see all of the details of this table setting, CLICK HERE. Fun tidbit…I bought these adorable felt leaf placemats at The Dollar Store. Yep!! I already own several of these products and love working with them. I will also be using a lot of these items in my table settings coming up this year. More details on the exact pieces I used in the posts above are in each specific post. Happy shopping! Fall will be here before you know it!! Hopefully, some of these simple ideas for fall table settings were helpful to you. Which one was your favorite?? I am working on another post with more specific ideas that might be helpful as well. To recieve notices for my upcoming posts, please subscribe to my blog for instant email notifications. Also, stop by my Pinterest page for more inspirations for decorating for fall and Thanksgiving.